Thai Basil, also known as Oriental basil, Asian basil or Bai Horapa in Thailand, is a cultivar of sweet basil commonly used in the cuisines of Thailand, Vietnam, Cambodia, and Laos. 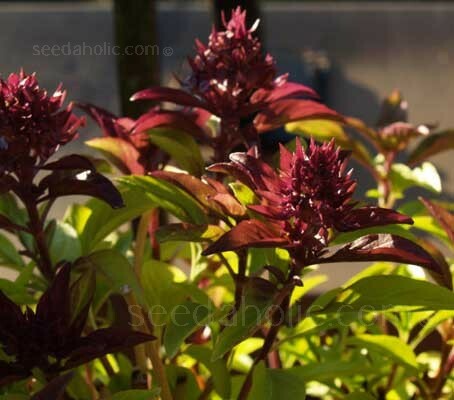 "Siam Queen" is a large leaf cultivar of Thai Basil that has been cultivated to provide a distinctive set of traits preferred in Asian cuisine. It has an identifiable liquorice flavour not present in sweet basil, and its flavour is more stable under high or extended cooking temperatures than that of sweet basil. It has a stronger taste than many other sweet basils. It is very fast and easy to grow, and also quite pleasing to the eye. It produces flower heads that are deep burgundy, which contrasted nicely against the pale green and burgundy leaves. Use Thai basil for Thai, Indian, and Italian recipes. Fresh, it can be added to salads, and either the fresh or dried forms can be used to flavour soups, pasta, and vegetable dishes. Thai basil matches well with rice, poultry, and seafood. In Thai cuisine, great handfuls of fresh Thai basil leaves are added to spicy stir-fries. Thai basil can also be steeped into a soothing tea and used to flavour vinegar and oil as dressing components. All basils are tender herbs that prefer daytime temperatures of around 25 to 30°C (77 to 86°F), they cannot withstand frost and will only thrive with night temperatures above 12°C (54°F). This tender perennial is usually grown as an annual but can be successfully grown indoors throughout the year. Basil can be grown indoors on a sunny windowsill or outdoors in containers or soil. It should be grown in a position that receives sunlight for around 6 to 8 hours a day. The dark varieties need a significant amount of full sun to achieve their deep and distinctive coloration. Position the plants in a sheltered spot that avoids cold winds. You can bring basil inside as a window herb if you plant the seeds during the warm weather in pots and bring inside to grow in a bright and sunny window. Tiny basil leaves, “micro leaves” are grown similar to cress and harvested while still small. They can be grown indoors all year round and look great sprinkled sparingly around the edge of a plate or top of a salmon fillet, they taste great added to sandwiches or mixed into salads. Simply line a tray with a double layer of moist tissue paper, cotton wool or similar. Sprinkle the seeds relatively thickly. Place on a sunny window-ledge, keep warm and moist at all times and harvest after a couple of weeks. If growing outdoors, Basil likes a fertile soil that has been well dug to allow good soil air circulation. Introducing well rotted organic compost or manure into the soil a month or so before sowing will help this. Before sowing ensure that the compost or soil is weed free and moist. If growing in pots then a general purpose compost is a suitable soil solution. Ensure that adequate drainage is allowed from the base of the pot. It is vital that Basil is not exposed to the last spring frosts so if sowing outside be patient and sow in late March. Sow at any time if the plant is to be kept indoors. If sowing inside and planting outside, you can sow in late February. Sow the seed thinly and if growing in pots sow enough for a few plants in each pot. Cover with 6mm of compost and firm gently. Basil seeds usually germinates in 7 to 14 days at temperatures around 22°C (70°F). Once the seedlings have developed two pairs of true leaves, thin out the weakest seedlings, leaving each pots strongest. Once established, basil needs very little care. If growing indoors in pots then weeds shouldn't be a problem. If growing outdoors then you can add an organic mulch around the plants to help aid soil moisture retention and prevent weed establishment. Add a small amount of fertiliser every month or so to any pot plants. Water at the base of the plant avoiding showering the leaves and stems. Basil once it flowers tends to produce a more bitter taste in the leaves. Pinching off the flowers is recommended unless you are specifically looking to harvest the seeds. Basil takes about 80 days to flower. In summer remove about 2/3rds of the plant leaving just enough for regeneration, this gives an abundance of basil leaves and elongates the growing period. Dry or freeze any excess leaves for later use. It is also a good time to sow another batch of seeds, this will see you through the season. Basil will grow all year round indoors but outdoor plants should be dug up and brought indoors before the first fall frosts if you want to extend the plants growing season. Light harvesting of leaves may begin after plants have become established. It is best done in the early morning when the temperature is cooler, and the leaves are less likely to wilt. Basil is a cut and come again crop. Harvest the top most leaves first, taking a few leaves from a number of plants. Use scissors to snip off the leaves, the leaves are easily bruised so handle with care. Basil should be harvested periodically to encourage regrowth, A full harvest should be done just before plants start to flower. Cut the entire plant 10 to 15cm (4 to 6in) above the ground to promote a second growth. It is especially important to do a final harvest before the temperature drops, as the plant is not hardy. After harvesting, many gardeners prefer to freeze the herb, rather than dry it, because the flavour and colour are better preserved. One can simply strip, clean and freeze the leaves on baking sheets before transferring them to bags. Alternatively, chop the leaves with olive oil and freeze in bags. You can also process the leaves with olive oil or a little water and freeze initially in ice cube trays, then transfer them to bags. To dry, cut the stems at soil level and bind stems of several plants together, hang the bunches up to air dry in a warm room for about a week, then remove them from the stems. Store them in a dry airtight container for up to 12 months. Basil has anti-inflammatory properties that may provide relief for conditions like rheumatoid arthritis or inflammatory bowel syndrome. It is a very good source of vitamin A since it is high in beta-carotene. An excellent source of vitamin K, basil also provides significant amounts of magnesium, calcium, iron, potassium and vitamin C.
Fresh Mediterranean basil leaf is a principal component of pesto alla Genovese (green pesto) and also appears in pesto rosso (red pesto), which includes tomatoes as well. The leaf is also used as a seasoning in tomato sauce, pizza, Insalata Caprese, salad dressing, and cooked vegetable dishes. Dried leaf is found in the mixed spice called "Italian seasoning," and sometimes is a component of bouquet garni. Thai basils, which differ from Mediterranean varieties, are used in Thai green curry and as a garnish. Basil is also used in desserts, including ice cream and sorbet, custard and zabaglione. The seeds are used to thicken the consistency of certain Thai foods. The essential oil is used in perfumes. Since the oils in basil are highly volatile, it is best to add the herb near the end of the cooking process, so it will retain its maximum essence and flavour. When interplanted, basil is said to improve the taste of tomatoes and peppers, as well as repelling tomato hornworms and aphids. Basil is also the one herb reputed to repel mosquitoes around its growing place. Basil is native to India, Asia and Africa but now grows in many regions throughout the world. It is prominently featured in varied cuisines throughout the world including Italian, Thai, Vietnamese and Laotian. There are now more than 60 distinct varieties of basil, each with a distinctive flavour, aroma, colour, shape and its own essential oil composition. While the taste of sweet basil is bright and pungent, other varieties also offer unique tastes: lemon basil, anise basil and cinnamon basil all have flavours that subtly reflect their name. Although Vietnamese and Loations also use the Asian varieties of basil in their cuisines, the purple-stemmed liquorice flavoured leaves have come to be identified as Thai basil. Thai basil is often confused with Holy basil which has a smaller, slightly hairy leaves and an aroma more akin to that of cloves. The genus name ‘basil’ is derived from the old Greek word basilikohn, which means 'royal,' reflecting that ancient culture's attitudes towards an herb that they held to be very noble and sacred. The tradition of reverence of basil has continued in other cultures. Many traditions about the herb's powers have to do with love and the afterlife. In India, basil was cherished as an icon of hospitality, while in Italy, it was a symbol of love. Usually grown as an annual.